In northern Iceland, 1829, Agnes Magnusdottir is condemned to death for her part in the brutal murder of two men. Agnes is sent to wait on the farm of District Officer Jon Jonsson and his family, who are horrified and avoid Agnes. Only Toti, the young assistant reverend appointed as Agnes’s spiritual guardian, is compelled to try to understand her. As the summer months fall away to winter, Agnes’s story begins to emerge. And as the days to her execution draw closer, the question burns: did she or didn’t she? Based on a true story, Burial Rites is a deeply moving novel about freedom and the ways we will risk everything for love. In beautiful, cut-glass prose, Hannah Kent portrays Iceland’s formidable landscape, and asks: how can one woman endure when her life depends upon the stories told by others? 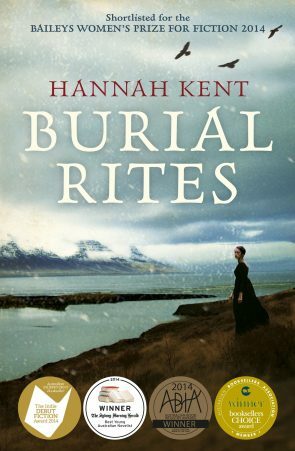 And, for more information, here is a video in which Hannah Kent answers some frequently asked questions about her first novel, Burial Rites (2013). Winner for FAW Christina Stead Award 2014. Winner for Victorian Premier’s Literary Award People’s Choice Award 2014 2014. Winner for Indie Awards 2014. Shortlisted for The Stella Prize 2014. Shortlisted for The Guardian First Book Award 2013. Shortlisted for National Book Awards 2014. Winner for Davitt Awards Reader’s Choice 2014. Winner for Davitt Awards Debut Fiction 2014. Shortlisted for Voss Literary Award 2014. Shortlisted for NiB Waverley Award for Literature 2013. Shortlisted for ALS Gold Medal 2014. Shortlisted for Victorian Premier’s Literary Award for Fiction 2014. Shortlisted for Baileys Women’s Prize for Fiction 2014. Winner for ABIA/Booktopia People’s Choice Award 2014. Winner for SMH Best Young Australian Novelist 2014. Winner for ABIA Literary Fiction Book of the Year 2014. Winner for ABA Nielsen Bookdata Booksellers’ Choice Award 2014. Hannah Kent was born in Adelaide in 1985. As a teenager she travelled to Iceland on a Rotary Exchange, where she first heard the story of Agnes Magnusdottir. Hannah is the co-founder and deputy editor of Australian literary journal Kill Your Darlings, and is completing her PhD at Flinders University. In 2011 she won the inaugural Writing Australia Unpublished Manuscript Award. Burial Rites is her first novel.